Veteran's Day was originally called Armistice Day (which it still is in some other countries), because it was the day that the armistice to end the first World War was signed. It was considered "the end of the war to end all wars". Yeah, I had to say that one a few times before I understood it. However, fighting stopped seven months before the armistice was signed. 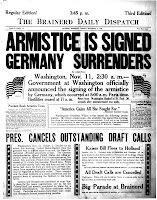 It was signed at the 11th hour of the 11th day of the 11th month of 1918, at Versailles, France. In the 1950's, Veteran's Day was expanded to include all veterans, not only those who served in WWI. And now you know. Go impress all of your friends.